Wedding Ultimate is our most complete package of services. You will receive unlimited performance time and an enhanced light show in addition to our regular package of services. ---Dinner/Cocktail Time: We'll be on hand during your dinner to introduce the wedding party as they arrive, play background music, help with introductions, toasts, etc. This usually lasts around 2 hours. ​---Dance music for the rest of the evening...as long as you'd like to go! This is our most popular wedding package. From the moment when your guests first begin arriving at your reception until the last dance of the night, we'll take care of all the details so you can enjoy a worry-free evening! ​---Balance of time (usually 4 hours) for dance music. 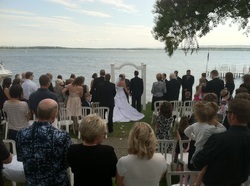 Are you planning your wedding ceremony in a location that doesn't have its own sound system, such as an outdoor venue? Let us take care of you! We'll bring a sound system that will help ensure that all of your guests can hear your minister's message and your exchange of vows, along with whatever music you select. Are you planning to have a vocalist perform at your ceremony? No problem...we'll provide the microphones needed for singers or speakers, and we can even provide inputs for musical instruments (such as a keyboard) if needed. We can also provide recorded music for the processional, recessional, candle or sand ceremony, or whatever else you need! 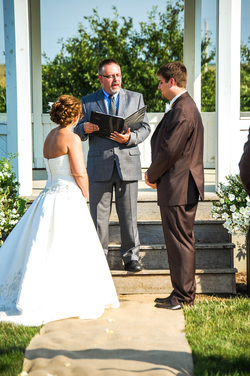 Music Man Productions owner Curtis Dean is licensed to officiate weddings in the State of Iowa. Curtis will work with you to create a ceremony as special as the love you share. As your ceremony officiant, Curtis will work with you to write a wedding service that matches your personality and style. He'll also attend and emcee the ceremony rehearsal and help with day-of coordination. After the ceremony, Curtis will return the marriage license to the county on your behalf. Add a special splash of color to your wedding reception with Music Man Productions optional uplighting package! Our LED-powered uplights can be color-matched to your preferences and form a pillar of light behind the head table, near the cake table, or adjacent to the dance floor. The location is up to you!